As I get myself prepared to leave the comfort zone of the Sands End area in favour of the wilds of Southfields, I can’t help but ponder about the restaurants, shops, pubs and friends that I am going to miss. OK, let’s be realistic – I’m only going to South of the River, I’m not trekking across the Alps or scaling Kilimanjaro but I count myself as extremely lucky to have been able to afford to live in this area for the last 4 and a bit years. 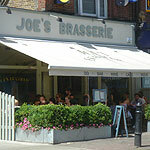 As I sit here and ponder, one particular restaurant keeps swimming before my eyes; Joe’s Brasserie. Part of the Brinkley’s empire Joe’s is a fail-safe restaurant for all those of us who utter those immortal words once or twice a month, ‘I really really just can’t be bothered to cook tonight.’ Those words are almost always followed by ‘shall we go to Joe’s?’. I do find it rather telling that I and several others that i know will trek the further 100 yards to Joe’s than go to our local (but extremely good, if you could ever get a seat let alone a table) pub. There is always a spot at the bar, not always under the awning, under the heat lamps. But if you are prepared to wait a little bit of time, they will get you a seat as quickly as possible. Once seated your extremely good-looking, but not necessarily hugely competent waiter/waitress will offer you a drink from the more than reasonable (unless you are having a half bottle) wine list. And while you wait for them to pick the grapes, put your order into the till wrongly and then remember what table you were sat at, you have some of the best people watching in London (well I think it is anyway). You also get time to read and inwardly digest the wonderful menu. Calamari, followed by a Joe’s Burger? I think so. But don’t forget the cheese and the bacon, not the same without those two – I should add, this does change your burger from the cheapest to one of the most expensive dishes on the menu – but frankly, who cares. And, this is the best bit (for the girls anyway), you know the top bun bit of the burger that you can never fit in and you leave, but then don’t leave because it’s sitting on the plate begging you to mop up the remaining ketchup and mayo with it… Well, you don’t get it. Genius. In my, obviously humble and unimportant, opinion burgers that size that are generally, not always, but generally eaten with a knife and fork, do not need bun tops. Last time I went my starter (shared with The Boy thankfully) was the biggest bit of deep-fried brie I’ve ever seen – but boy it was good. melt in the mouth good and, because I was sharing it, it was semi-guilt free goodness!! I went all virtuous last time and had a chicken salad while my three fellow diners tucked into a burger a piece! I ordered without the olives (not a fan) and bravely kept the caperberries in my order, having never tasted a caperberry I figured I ought to try one. Tried it. Didn’t like it. Picked the rest out. There isn’t much to say about the salad, it was chargrilled chicken, cooked very well, juicy yet still with a yummy charred and almost smoked flavour on a bed of little gem or cos lettuce. Half a tonne of parmesan had been poured over the top making my healthy option, not so healthy, but it was what it was a great, simple fuss free salad. All I needed. If, after burger, calamari, deep-fried brie and chips, you can still force yourself to have a pudding, try the hot toffee cake. Wow. Nothing else needs to be said. So I haven’t praised Joe’s to the high heavens, but it really is a great place to spend an evening. Everyone there is enjoying their dinner, the company, the ambience the food and the wine. And, it’s always full. They are certainly doing something right! So, go there, don’t expect silver-service, don’t pretend you’re in Mayfair; chill out, have fun and catch up with some friends over several bottles of wine and a good feast. Beata – the most wonderful waitress; always cheerful, always good fun, and the service is stunning. Joes has been responsible for nearly as many hangovers as the Bored Cook…. I’m happy to say after reading your lovely review, that my husband and I own Joe’s Brasserie (we have nothing at all to do with the running or cooking!) We’ve eaten there quite a few times too, and have also really enjoyed it. Wow, hadn’t ever expected an owner to read my reviews! Thank you very much for the comment, what a small world.